My app is not receiving enough downloads now, I don’t know what’s wrong with my app? Earlier there was a good number of users, but gradually they are decreasing and I seriously don’t know how to tackle this issue? First of all, you need to understand that getting an app and making the users engaged to your app are two different aspects, and they both need to be addressed with different strategies and the techniques to help the app to combat the challenges thrown by these two factors. The moment your target audience pen your app, the onboarding process is the very first conversation screen with your users. The best technique to make it flawless is integrating exactly what you expect from other apps as a user. Your onboarding need not be a tutorial of the app, rather it should focus on how the app would offer benefits to the users. Add more visuals and minimal content so the users stay engage with the creative color theme and the graphics. You need to keep the sign-up process available with the social media login as well, which will help the users to save their time and log in by filling their social media credentials and access your app in no time. When I mention app speed than I am clearly hinting at the technical hiccups your app would take due to any technical issue. Your app users have plenty of options available in the app market, and if your app product gives the technical glitches now and then and curb the app accessing, then they would certainly look for another app. Test, test and test…don’t skip testing your app’s each and every functionality or any feature, because if your app takes the unwanted breaks in-between then your users would certainly abandon it. Push messages or the push notifications are the delicate aspects of your mobile app, if you fail to offer them correctly, and then it becomes a headache, but if you understand and imply them accurately then push messages to become an asset for your mobile app. You need to give the excessive dose of push messages to the users, rather you need to maintain a frequency depending upon your market research and you must allow the users to shut off or switch on option for the push messages so users can enjoy than getting bugged due to it. Your app is a piece of technology, so it needs to be upgraded time and again and must introduce the number of new features to the mobile app so the users will get some fresh and innovative feature to try with your mobile app. You need to keep in touch with your mobile app development company to integrate the required changes at the regular intervals. 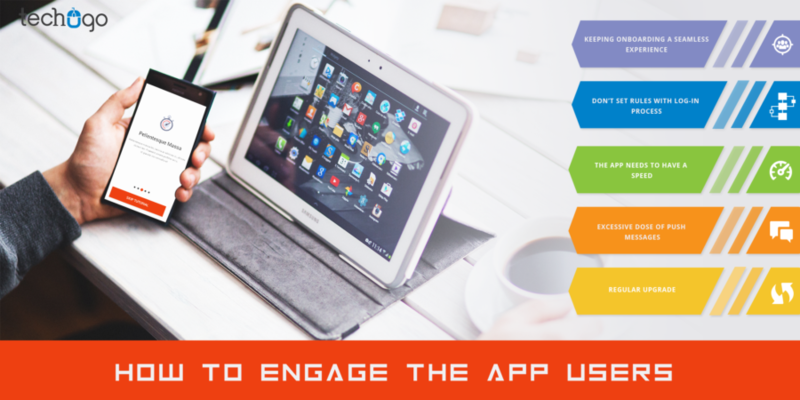 Engaging the app users is an art, and needs to be attained with the due course of time, the role of your mobile app development company plays a huge role here, so you must pick a top mobile app development company like Techugo, which has enough exposure and the experience to keep the app users stay engaged with the mobile app.